Thank you for shopping with us! Your satisfaction is our greatest motivation. If you have any questions, please feel free to contact us and we will try our best to make you satisfied. This Harper&Bright Designs modern solid wood bunk bed is designed in a modern classic style. 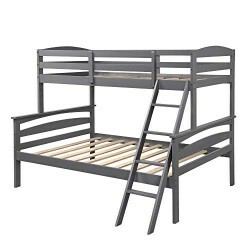 This bunk bed is a versatile piece of furniture for living and guest accommodation needs. The clean lines and rich design allow the sofa bed to be integrated into the existing living room décor while providing guests with additional sleeping accommodation. You can dress up with decorative pillows to add a modern touch. Its solid wood frame makes it durable, while the wood detail adds a classic touch. This bunk bed not only renovates the living space, but also enhances the feelings of parents and children, allowing parents to have more companionship. *Manual measurement has been used,there may be some reasonable error. *All the pictures are taken by actual samples, slight chromatic aberration may occur due to lighting or display. A solid wood construction made with 100% Pine wood, each bed is built securely,allowing children to get safely in and out of bed. This bunk bed is a versatile piece of furniture for living and guest accommodation needs, can easily be separated into 2 free-standing beds. The Full bed provides a place for parents to rest and take care of their children. Guardrail runs along the length of the bed for added safety. Complete with all tools for easy assembly.